Para ver mayor información sobre KRAFT L400GTS-CNC, incluyendo información de marca, fotos, videos, y más, dé click aquí. "High precision spindle: Super precision angular contact ball bearings (NSK brand, Japan) are fitted on the cartridge spindle for high rigidity and high accuracy in the long run. Spindle run-out<3um. 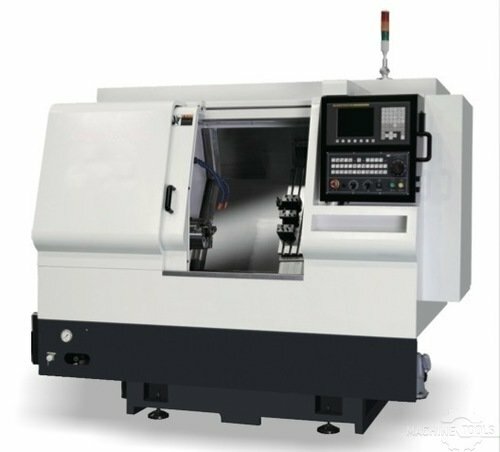 Superior efficiency: Equipped with a maximum 5500rpm spindle, 18/min X/Z axes rapid, the CNC lathe is capable of high speed, high efficient and high automation machining, especially with a bar feeder. Bed: The bed is made of high quality meehanite cast iron. With a cap act 60 degree slant structure, it allows easy chip disposal and high space efficiency. High accurate feed: AC servo motors and high precision ball-screws (NSK/THK brand, Japan) are adopted on X/Z axes for high machining precision and high accuracy in the long run. Repeatability of X/Z axes<+_1um. Gang Tool： A unique gang tool system offer quick and accurate tool changeover with hight repeatability and reduced cycle time dramatically. Heavy cutting: High speed and precision hydraulic cylinder, collet chuck or high rigid precision hydraulic chuck allow the machine to take serious cuts and remove metal faster even on tough materials. CNC system: A powerful Fanuc CNC system is equipped for continuous and stable machining. "